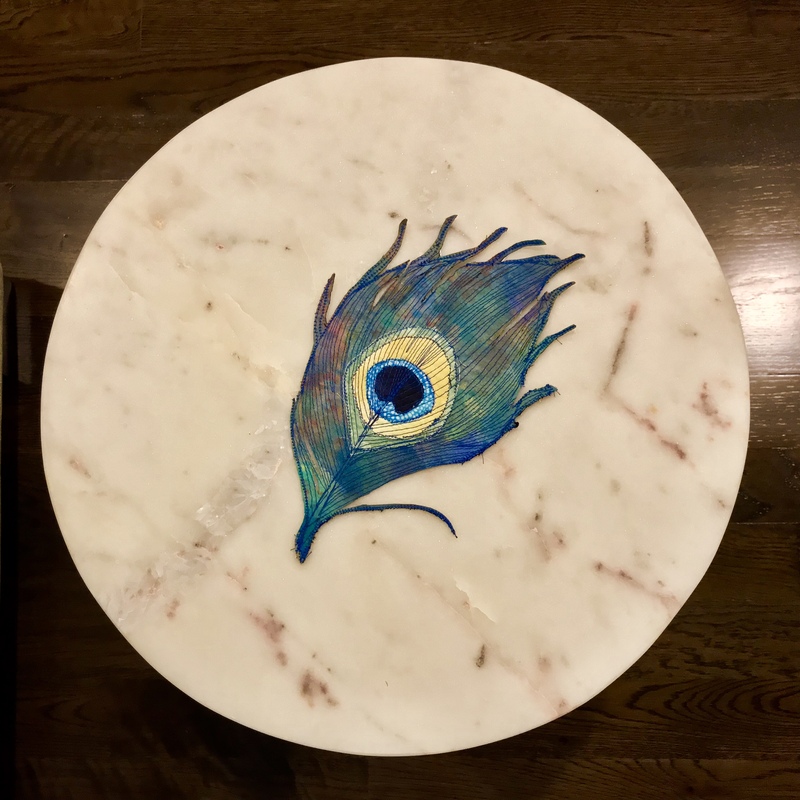 The peacock is the theme of the India Quilt Festival, 2019 and I have designed a quilted peacock feather that you can make–as a participant in q quilt-along–to feel a part of the first ever quilt show in India! This is the fourth and final post in this quilt-along. I have given the list of materials required in the first post, the cutting instructions in the second and the tracing instructions in the third post of this series. Now the real fun begins. I promise you that this is addictive! I would have liked to have a free-motion quilting foot, but a walking foot will work equally well for this small feather. I do not have even a walking foot, but I have not added a batting to my feather, so I think a regular foot will have to work here! Let us see how it goes. The first thing I have to do is quilt the centre of my feather (which you may remember, I do not have in place at all!) So I flip over to the backing side and quilt the outline of the centre of the feather. I turn it around and realize I had white thread in the bobbin, so the outline shows up in white on the front. I am not very happy with this, but eventually, it will not matter. Quilt the outmost outline of the centre of the feather, from the backing side. The outline shows up in front and will serve as a guide for placing the centre layers. 2. Now I know exactly where the centre of my feather lies! I pin it in place, and zigzag over the edge of the outermost green layer. I then zigzag over the other three layers, beginning with the centremost to get the pin out of the way. Place the 4 layers of the centre fabric and sew down the outmost layer using a zigzag stitch. Next zigzag stitch over the innermost layer, followed by the light blue and lastly the yellow. I have used dark blue thread, but you could use a deep yellow, or a dark green or even black—anything that will contrast nicely with your fabrics. If you do not have a zigzag stitch on your machine, use the straight stitch. A tiny satin stitch will work equally well! The great thing about this feather is that you do whatever you are comfortable with. The intent is to have fun! And now the fun begins. 3. With centre in place, I turn the sandwich over and start quilting over the lines in the pattern traced on the backing. I do the central spine of the feather first. Start quilting over the rest of the feather from the back, beginning from bottom of the central spine, travelling all the way to the top and returning to the bottom. The trick is to quilt slowly; it is quite simple really, just quilting over a line drawn on the fabric! …stop the machine with needle down, turn around the sandwich and travel back to the centre. Travel up a little to the next line and repeat! …quilted over the pencil lines from the back! Once one side of the spine is quilted, I sew over the lines on the other side. In less than 10 minutes, I am done! The best part is that one does not need to panic if one strays from the lines. Your feather need not look exactly like mine, after all. 5. I am ready to add details to the feather now. I start, literally, to quilt between the lines. Note that I go beyond the outline in several places, just travelling with the flow! Another 10 minutes, and I have finished quilting my feather! That looks great doesn’t it? Let us check it from the front? 6. Now I am ready for bringing my feather to life! I pick up my really sharp scissors and start trimming the feather along the quilted outline. At first, I am a little circumspect. Use sharp scissors to trim away the excess fabric. But then I become more adventurous, travelling almost up to the central spine with my scissors to make my feather look realistic. Let me check it from the back. The feather from the back. Time for the final reveal? For a list of materials required and the PDF pattern for the quilted feather, refer to the first post about this quilt along. For the cutting instructions for the feather, refer to the second post about this quilt along. You can download a PDF file containing cutting instructions from that post. The tracing instructions (including a PDF file) are given in the third post, a continuation of my second post. The download link to the quilting instructions is below. 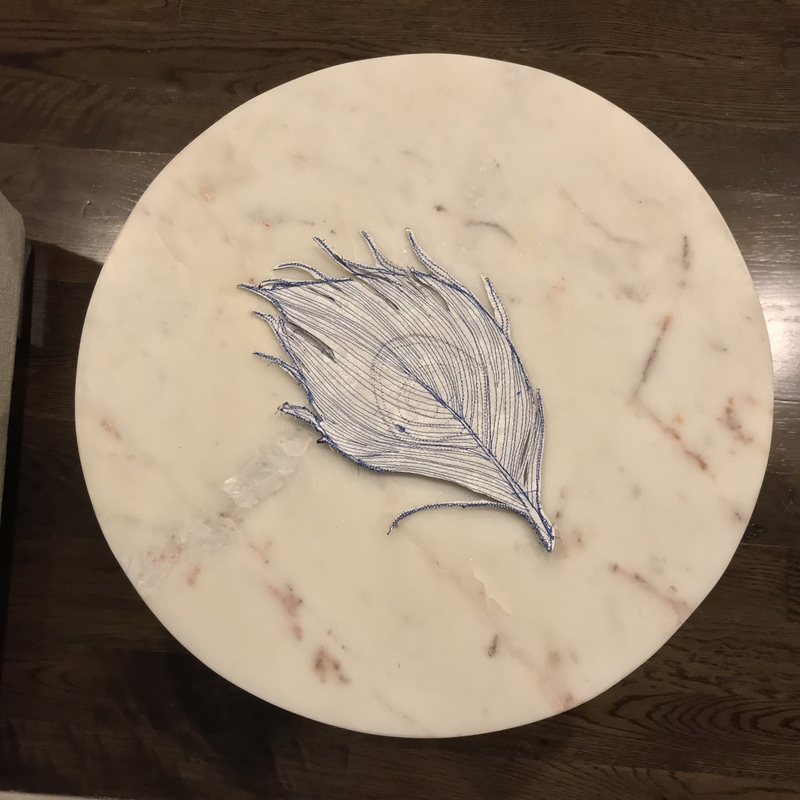 If you want to make a larger 10.5″ or smaller 5.5″ feather, download the pattern below. Remember you need to keep the feather and background fabric at least 2″ bigger than the finished feather, on all sides!